Not many young women in the early 1900s had the audacity to “blow into” the office of a member of the U.S. House of Representatives in Washington, DC, looking for a supporter of her cause. In this case, the “young lady” was Eve Newman, the office was that of Rep. Campbell Bascom Slemp, the person she was looking for was Mr. Mayo (Rep. Slemp’s friend and business partner) and the cause was Hindman (KY) Settlement School’s endowment. C.B. Slemp, a Republican congressman from Virginia, described this serendipitous meeting with Eve Newman in an undated letter to Katherine Petitt, who was then director of Hindman Settlement School, followed by an account that proved Miss Newman’s boldness paid off for the School. Rep. Slemp was already planning to meet with Mr. Mayo in New York and invited Miss Newman to travel with him. There, she not only met and presented her proposal to Mr. and Mrs. Mayo with successful results, but Slemp also acquired letters of introduction for Eve and himself to Andrew Carnegie and Russell Sage. Slemp concluded that “You are sure of an endowment I think of $33,000 and probably $38,000. That would be about 1/3 of the total amount you desire.” This must have been exciting news to Pettit. “The Newman Aunts” website stated that before Pettit left Hindman, she wanted to secure the School’s future by raising an endowment of $100,000. Eve Newman had played a large part in this effort. ...the very pleasing and charming personality of your representative. Her devotion to the interest of the Hindman school, her naturally unaffected disposition as well as her personal attractions appealed to all of us very strongly and I really think that this was one of the contributory causes of the enthusiasm all of us had while in New York. 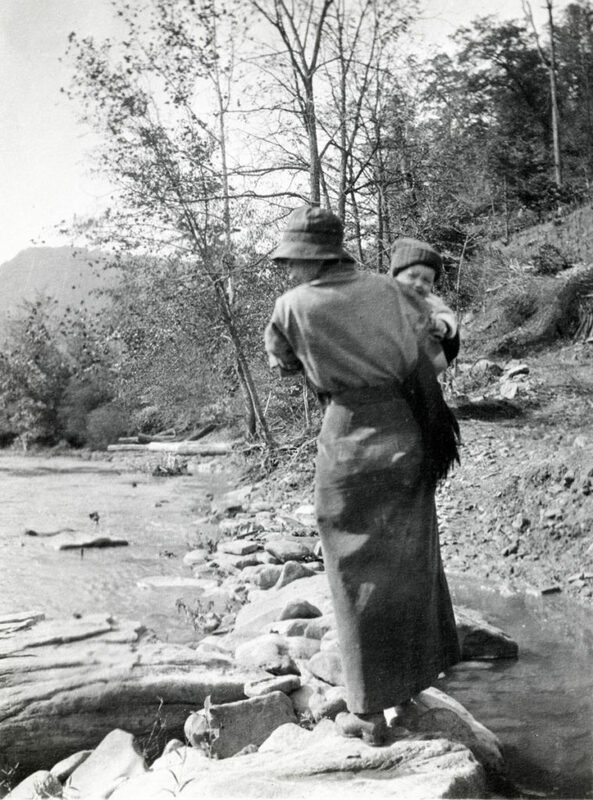 Slemp’s descriptions of Miss Newman indicated that she was a perfect fit for a fundraising position and Miss Pettit and Miss Ethel de Long were fortunate that, in 1913, she followed them from Hindman to assist in the establishment the new Pine Mountain Settlement School as fundraiser and office and field secretary. She lived in Old Log with Miss de Long and five little boys, whom they cared for. Miss [Margaret] Watts, Miss Newman and I spent the whole afternoon up at Miss Newman’s. You see, we three are about the same age which makes it very, very nice. (September 1914) We have been staying over at the tent with Miss Rockwell [Mary Rockwell Hook, the School’s architect] all week. This morning we made omelet – yes with real eggs!!! She is so nice and we have been having the nicest evenings together. Last night Miss Newman stayed with us too, so she and I spent the night in one single bed which was on the very edge of the tent floor over quite a little precipice. Once she nearly went out of bed and you ought to have heard the scream. (Fall 1914) After the little boys went to bed Miss [Ethel] De Long, Miss Newman, Peg, Ethel [McCullough] the two new workers and I sat around talking and feasting on cider, just made that day, nuts, raisins and cakes. We talked about plans for the school, what we would do next year and all until it got very exciting. (October 21, 1914) This morning [Miss Ethel McCullough], Miss Pettit and Miss Newman started on a twenty mile walking trip down “Greasy” expecting to be gone until the end of the week. They were pictures in their khaki skirts and middies, with their clothes slung over their back in some fetching pack. While in Kentucky, she met and married Alan [P.] Gilmour, and they moved to California. After Alan’s death in 1925, Eve moved to New York City and attended the New York School of Social Work. She worked in various positions in welfare and social work at different places around the United States, including New Mexico, Oklahoma, Mississippi, and Illinois. During World War II, she served with the American Red Cross Recreation Department in North Africa, then retired to Waynesboro. 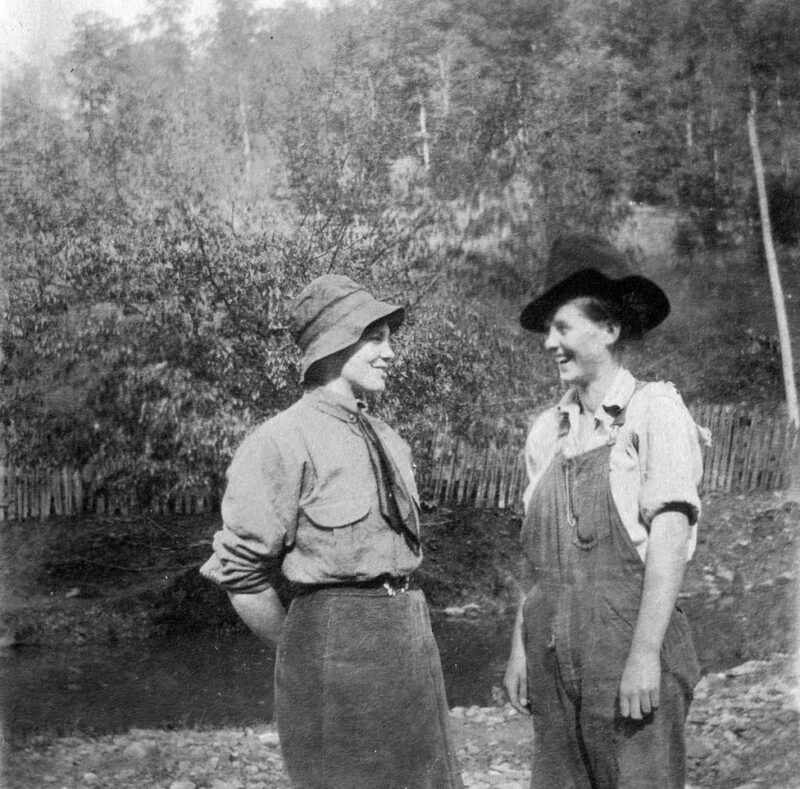 According to “The Newman Aunts” her marriage to Alan Gilmour on February 12, 1916, was a good match, as both shared a “fearlessness and singlemindedness of purpose.” Read more about their courtship and marriage here. “The Newman Aunts” site also details much about the life of Alan Gilmour (1870-1925). Alan Pegram Gilmour was born in Henderson, Kentucky, the son of a wealthy, Scottish, tobacco merchant. Gilmour worked in Lexington as an attorney, among other careers. He died an early death, leaving Miss Newman a widow at age 37 after eight years of marriage. Eve Louise Newman Gilmour was born on April 16, 1888, in Milton, Pennsylvania. Her mother was Emma Stouffer Frantz. Her father was Jacob Newman (1841-1920), who was the justice of the peace in Waynesboro, Pennsylvania, and had signed Eve and Alan’s marriage license application. Eve Newman Gilmour died in May 1980 in Waynesboro. Subject LCSH Newman Gilmour, Eve, — 1888 – 1980.
file folders in filing cabinet. the Pine Mountain Settlement School. by United States copyright law. illustrations by or about Eve Newman Gilmour. 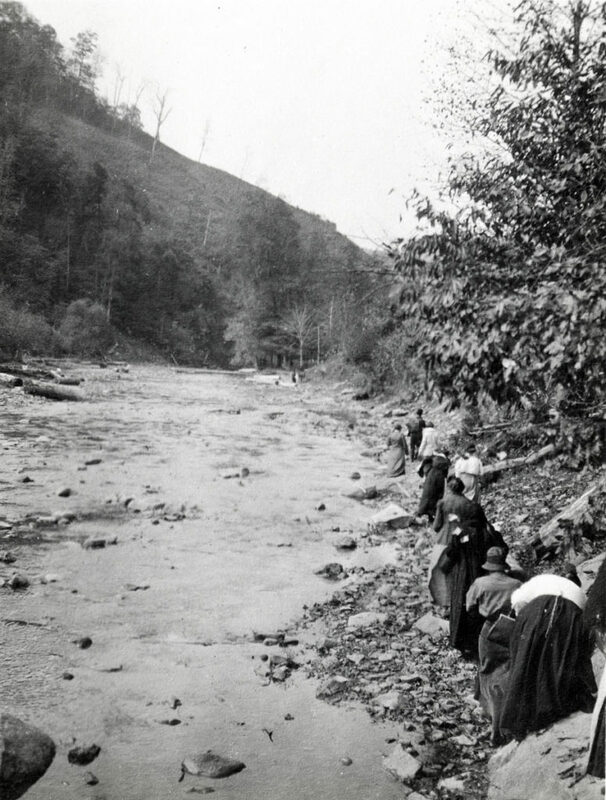 Settlement School, Pine Mountain, KY.
HISTORY, GUIDE TO DE LONG-ZANDE COLLECTION. Mountain Settlement School, Pine Mountain, KY. Internet resource.